Oooh, this weekend’s project is one of my favourites for a while. 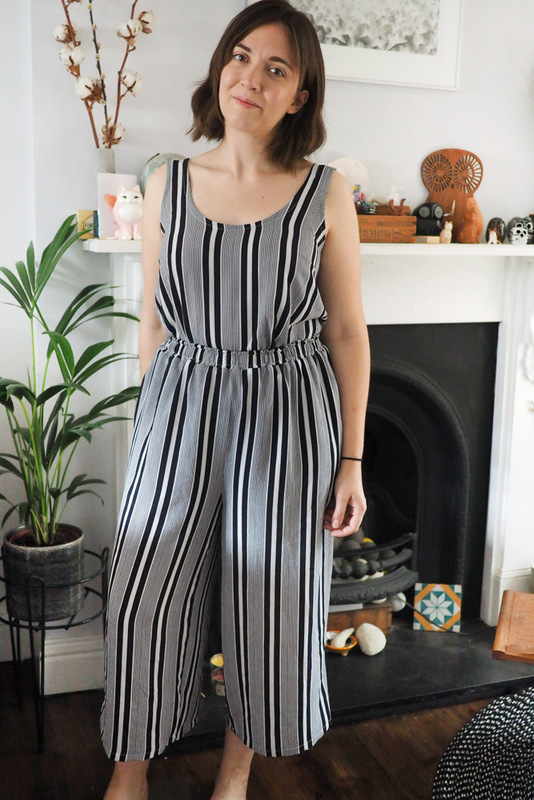 It’s a fake jumpsuit, i.e. 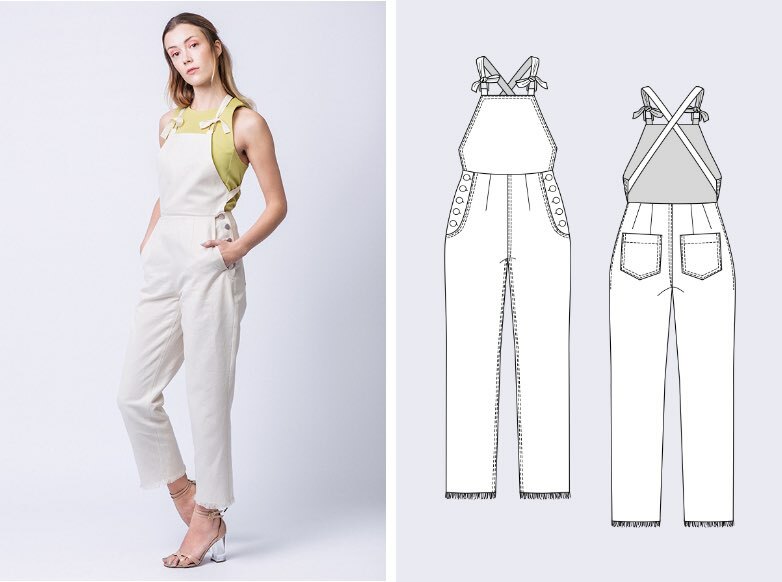 actually separates made up in the same fabric – Named’s Ninni culottes mashed up with Grainline’s Tiny Pocket Tank. 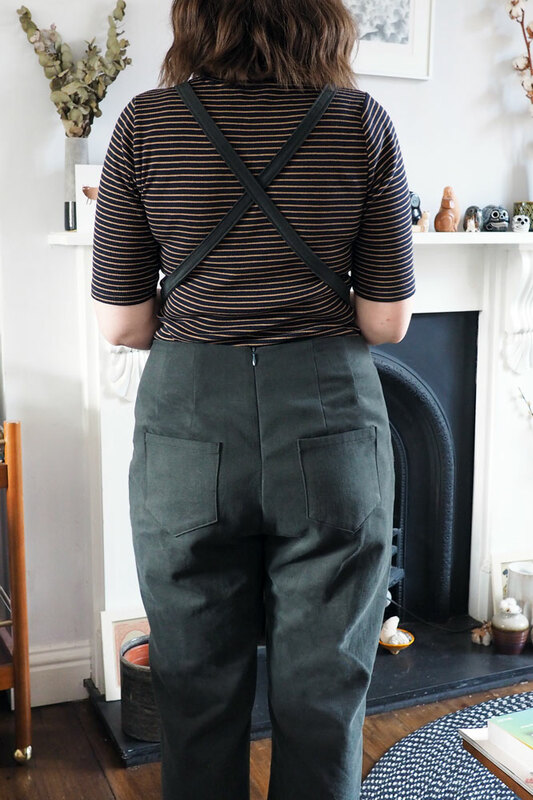 I wasn’t going to buy the Ninni pattern as it’s so simple and I’ve hacked this sort of wide elastic-waist pant before, but I just love their drafting and it was only 10 euros for the PDF. I was glad for the purchase as everything about the drafting is just right for me: the rise, width, waistband etc. I’m happy to pay 10 euros for someone else to deliver me what I want! Sewing them up was fast and easy, except the part where I dozily sewed the back to back and front to front at the side seams instead of a back to a front, and had to unpick it all, on BOTH legs. Don’t sew when hungover, kids. 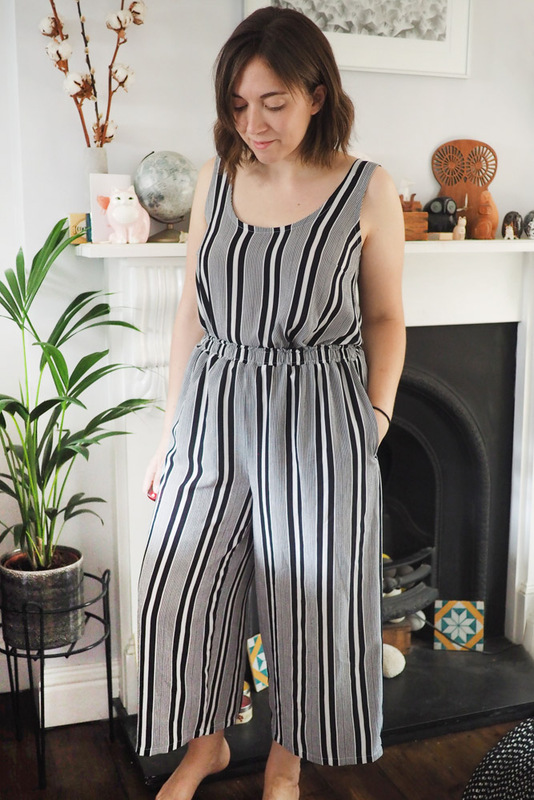 I was going to be extra-lazy and graft the leg pieces together as the outer side seam is pretty much straight, but decided I wanted the inseam pockets. I’ve tacked across the pocket top and bottom to try and keep them facing forwards. 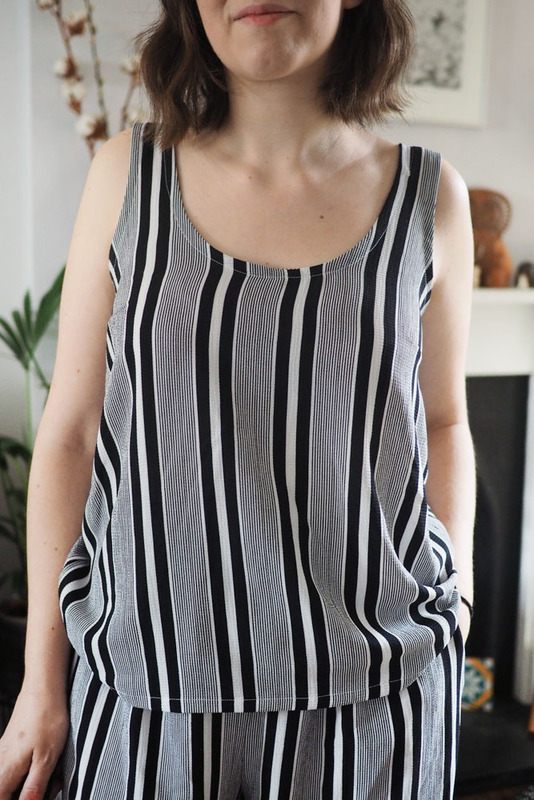 The Tiny Pocket pattern doesn’t seem to be available any more; it was Grainline’s first-ever downloadable pattern and I assume the Willow tank has replaced it in the line-up. It’s a real nice well-drafted basic so I’m glad to have it in my PDF stash. Guts shot; I’m proud I got the binding so neat and flat because this fabric was so difficult to press. 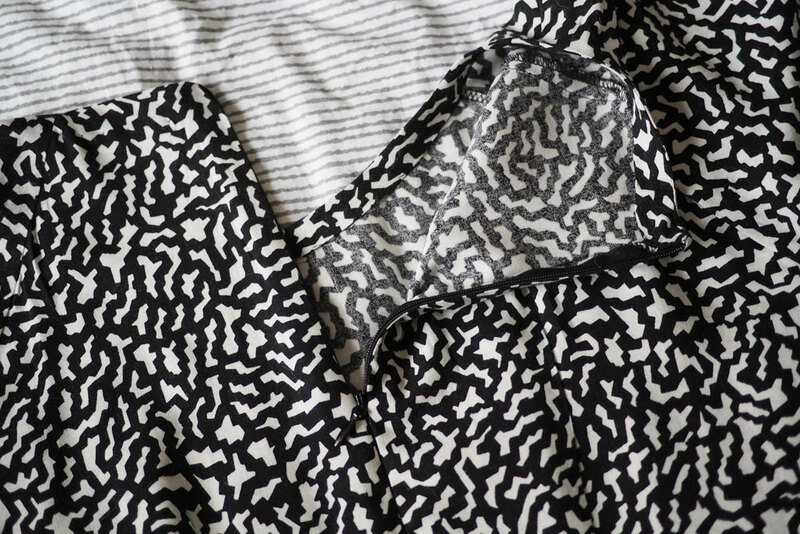 I actually self-drafted an all-in-one facing but didn’t have enough fabric left to cut it and no suitable plain stash fabric; there was only just enough left to cut a few bias strips! 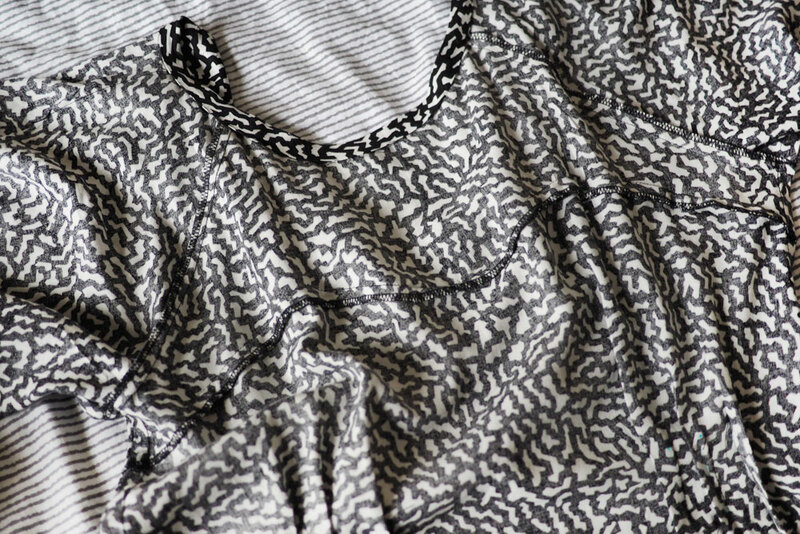 I sewed the armhole binding flat before French-seaming the side seams, and the neckline binding was done in the round. The fabric is a poly crepe from Minerva Crafts. 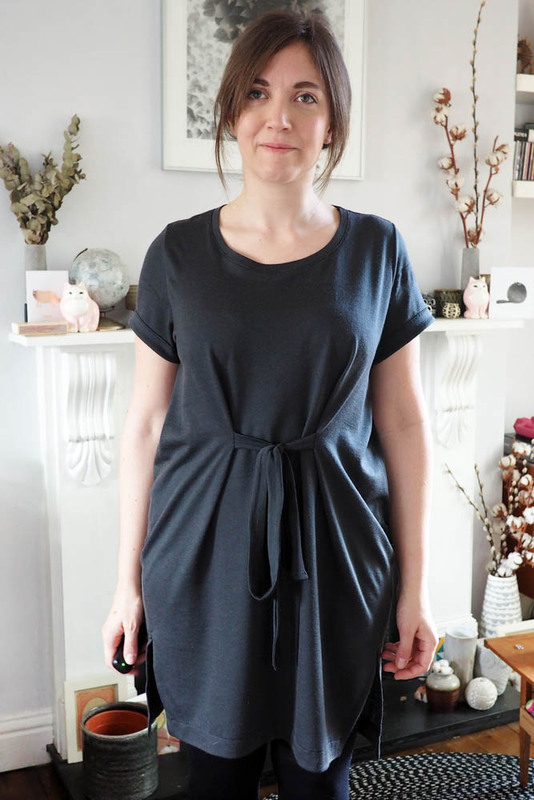 Their description of it is spot on: it’s a dream to sew with (apart from not taking a press very well), has a little comfy stretch, is pretty much opaque but very lightweight with a wonderful drape. I love it! 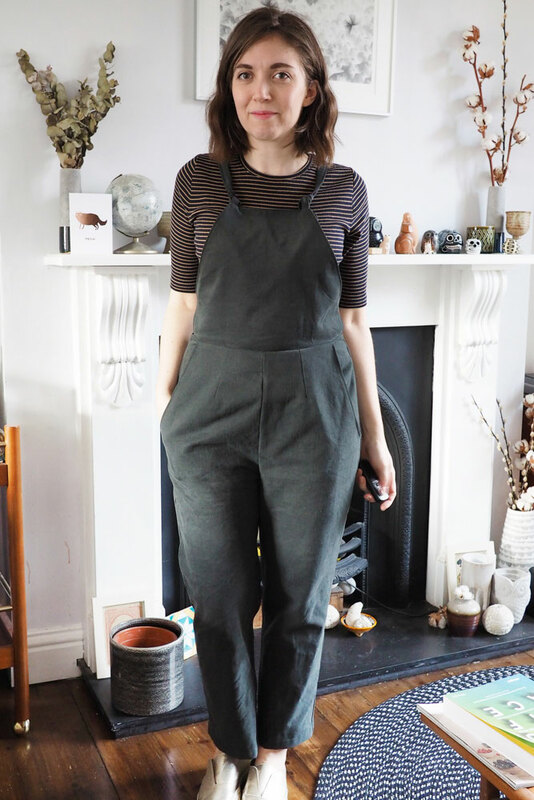 I got my culottes and top out of the two metres with very little scraps to spare. 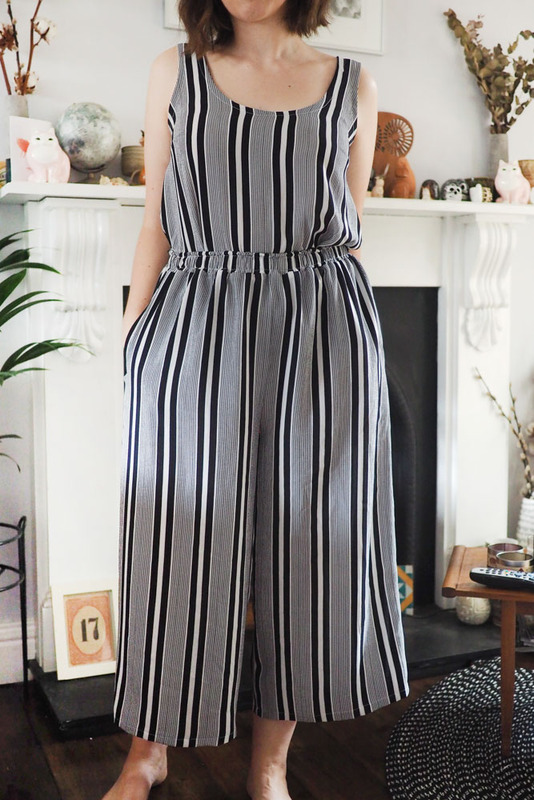 I’m thrilled with these separates; I can see myself wearing them all summer both together and mixed up with other garments. 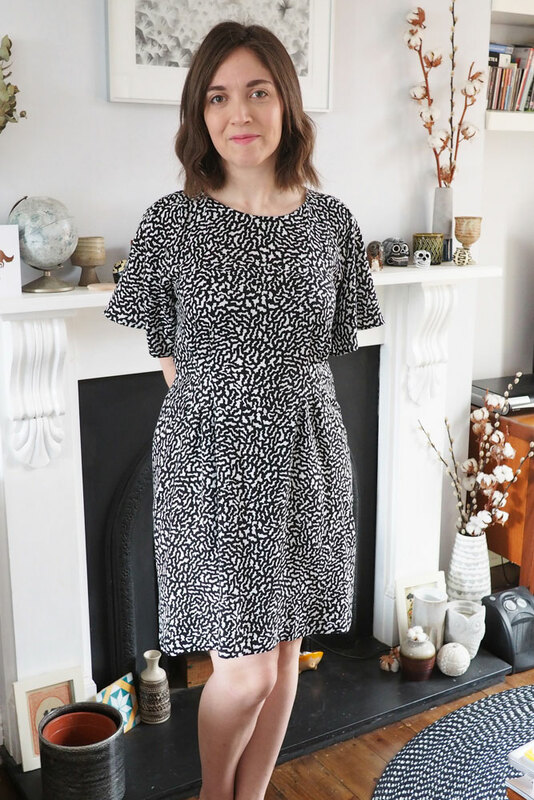 My current Named pattern streak continues: this is my first take on the Reeta midi shirt dress pattern from their latest spring-summer collection. It features a lined back yoke, camp style collar, a drawstring waist, pleated patch pockets and side splits. Before I talk about the pattern, the excellent fabric: it’s Spoonflower‘s poly crepe de chine, which they sent me for free to review. 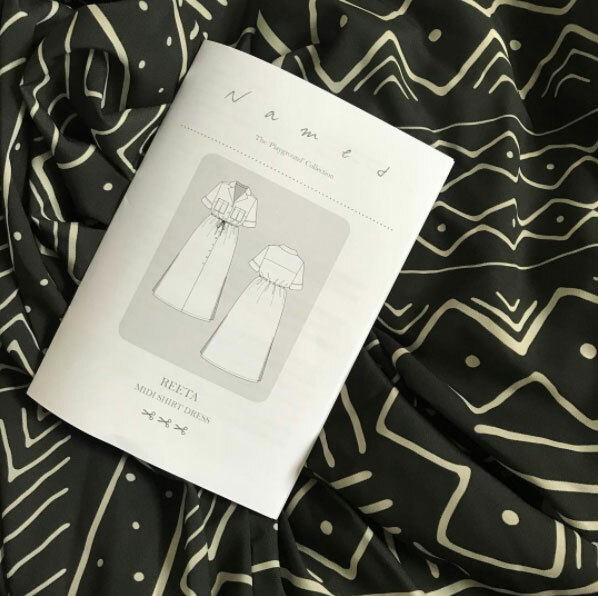 Spoonflower describes this substrate as “a sheer, lightweight 100% polyester crepe fabric ideal for projects that require a soft drape and a delicate weight. This exciting fabric features bright colors that hold up very well to multiple washings”. My own impressions are that the colours are indeed how I expected and the print is sharp – it didn’t fade in my prewash and I wouldn’t expect it to in future washes. It’s opaque enough for a dress and drapes very well, yet isn’t overly shifty and difficult to handle. You will want to use a fine needle and silk pins as it does show stitching marks/holes quite clearly. It feels just a a little plastic-y (I’d be interested to try their silk CdC sometime), but it took a steamy medium-heat press very well and doesn’t feel too sticky to wear, especially in this breezy style. 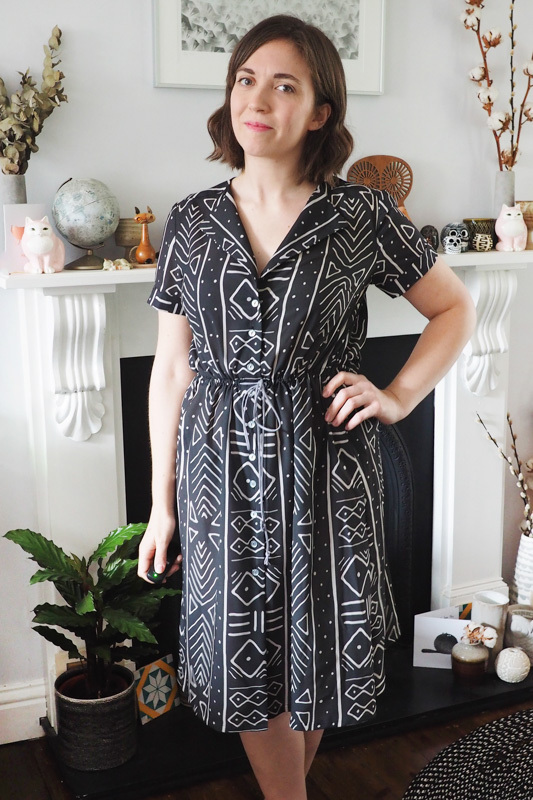 The major benefit of Spoonflower of course is that you have access to a huge user-generated library of prints to pick from: I went for this Mudcloth-inspired print by domesticate. They ship directly from Berlin now too, so it’s much cheaper to order and get delivery to the UK (and no customs charges, for now at least, hurrah). 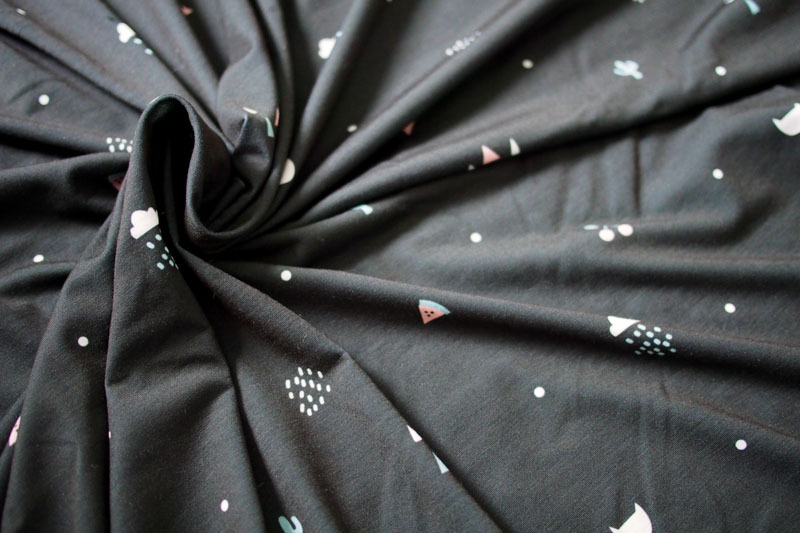 Thanks to Spoonflower for sending me the fabric; I’ll definitely be ordering more sometime soon. 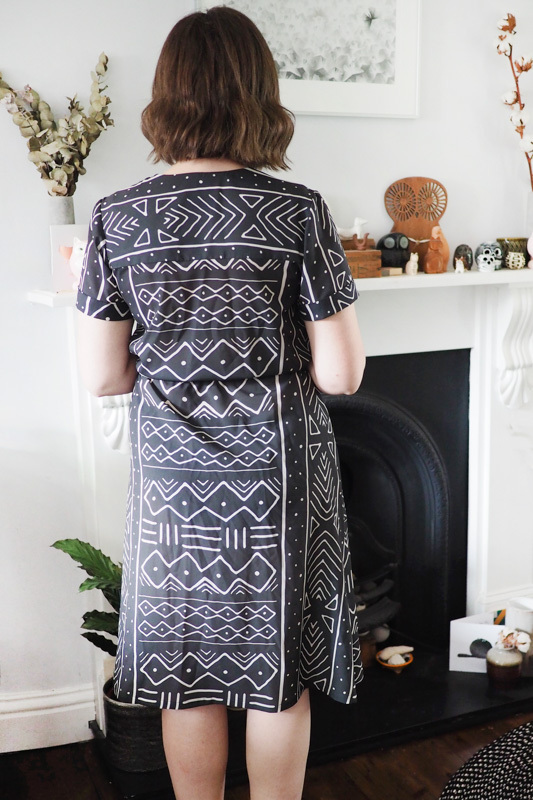 Onto the pattern itself: as you might have noticed, my version actually eschews a lot of these lovely features that attracted me to the design in the first place. I made the silly mistake of starting this project on Saturday morning hoping to have it ready to wear for a friend’s birthday drinks in the evening. Cutting it took an age due to all the pieces and the grudging desire to match this print I chose, so I was generally trying to rush and ended up getting quite frustrated and slapdash. 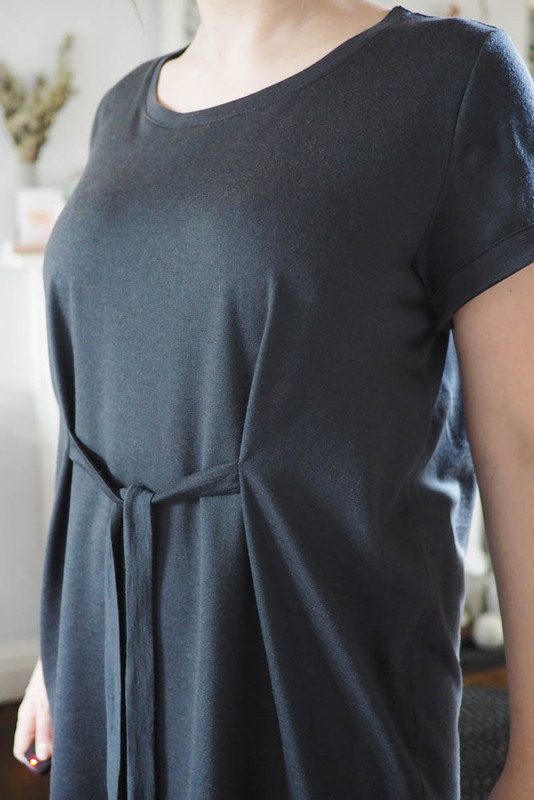 For some reason my collar piece ended up a good inch too short to fit between the notches on the neckline – I need to check if that was user or pattern error (likely me in the aforementioned rush). But the pattern luckily works just fine with no collar and just the folded-back lapels. 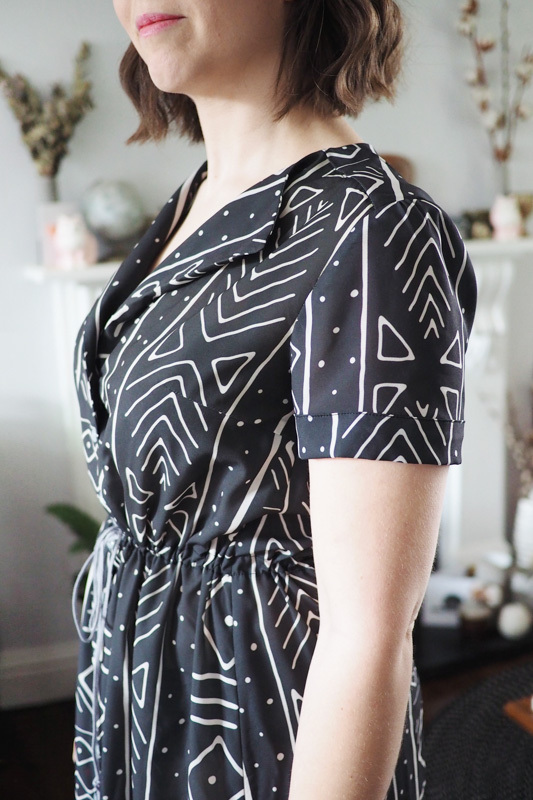 I made up the pleated pockets and pinned them on, but decided they were too much fuss for this print. I ended up shortening the skirt about eight inches which made the splits look a bit silly, so I sewed the entire side seams closed. 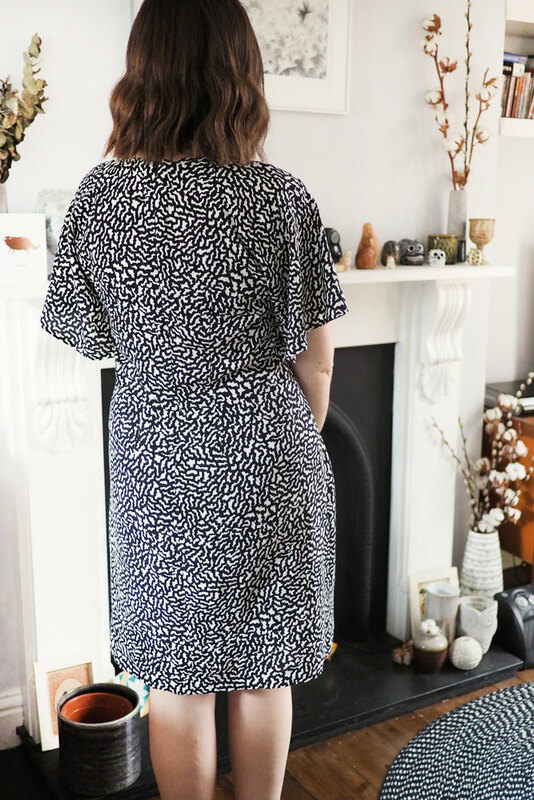 It was close to maxi length on me before I chopped it, which actually looked rather nice, albeit a bit much in this print. In terms of fit, I made a straight 40 and it’s spot on. 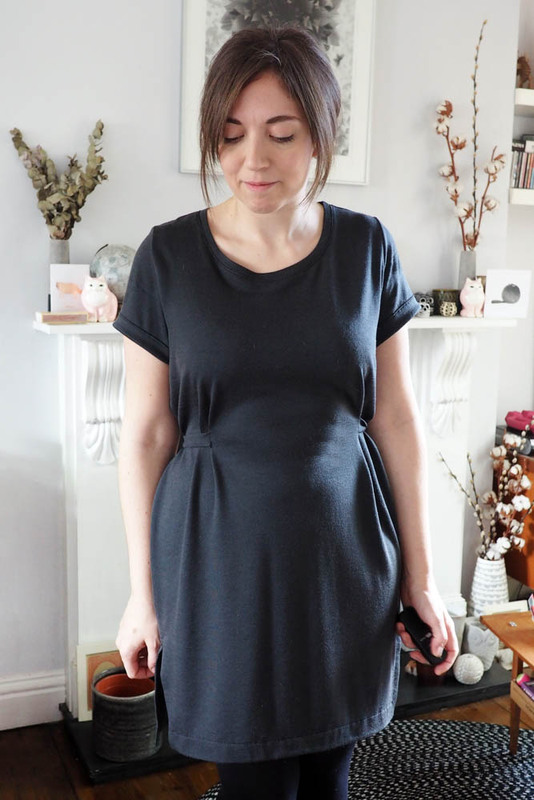 I especially like the sleeve drafting, they’re very comfortable and eased-in very nicely. The waist and hips are blousy and open so overall as long as the shoulder and upper back is good this should be an easy one to fit. Fit aside, this is actually rather an involved sew and has some tricky steps, hence why even speedy sewer me did not get it finished in a day. The instructions are good but I did end up deviating a bit to finish the enclosed yoke and sleeve cuffs my own way. I sewed real buttons and buttonholes but feel obligated to point out that it does slip on over the head, so you could definitely be lazy and sew the buttons straight through both layers. It’s not my neatest work overall but the design and fabric are quite forgiving luckily! I sometimes have a strange ‘gotta-have-it’ urge for a pattern that at first glance doesn’t really seem to be my usual thing. That was definitely the case with Named’s new Ansa dress, and I’m happy to report that my inkling was true and I lurrrrve this dress. 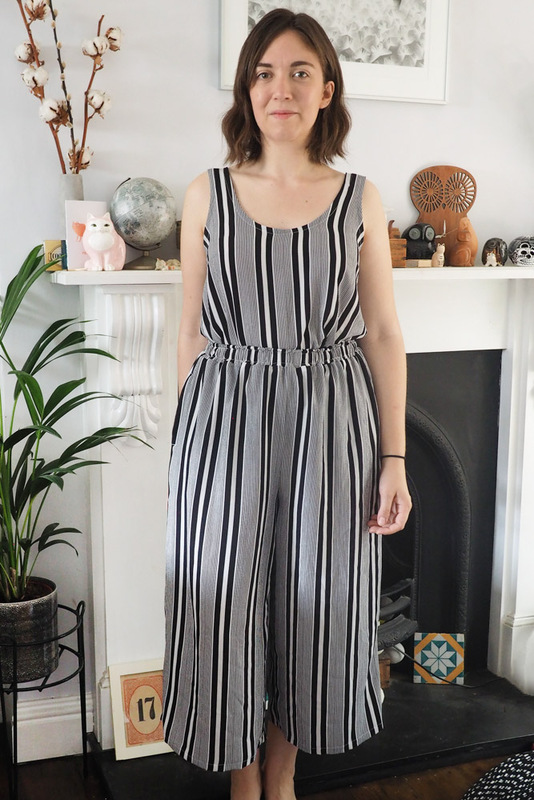 I bought the pattern at the same time as the Ronja dungarees, and sewed them one after the other. 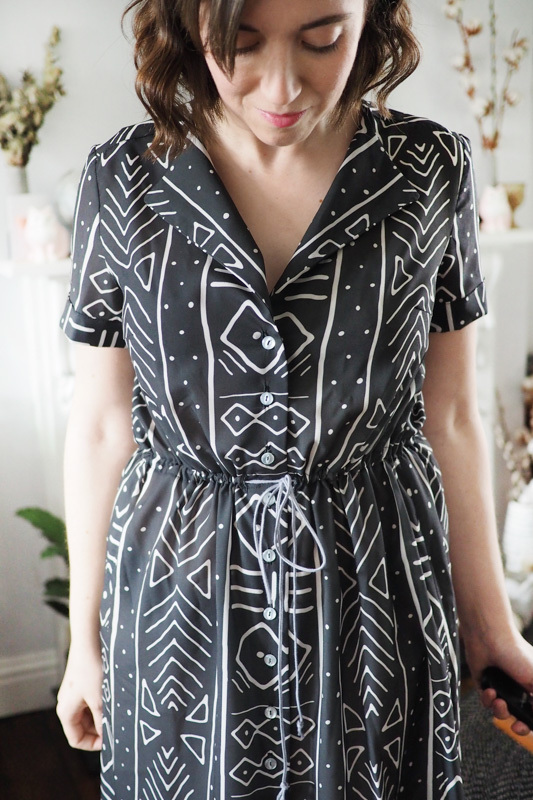 Named patterns are just such sewing joy, and I need those sorts of projects when sewing time is scarce. 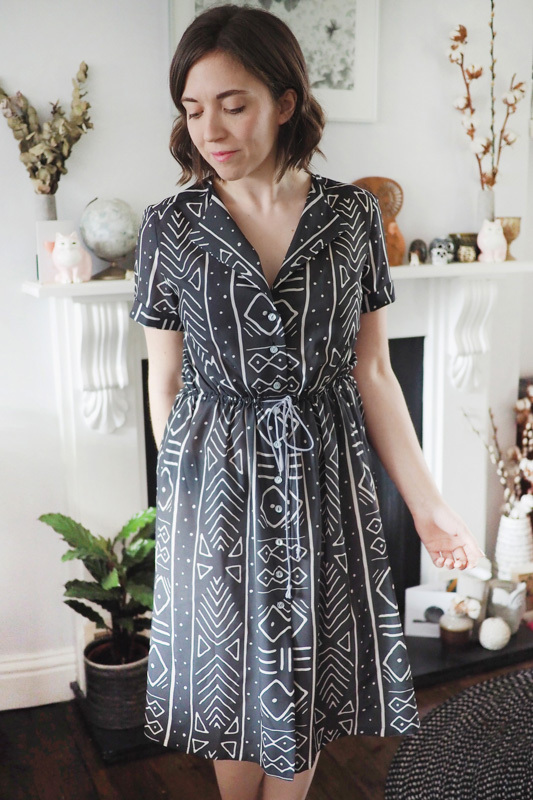 I really agonised about whether to sew to the top or dress first, but haven’t sewn a fun dress in a while and I have an event next weekend that it may get cracked out for. Based on the finished measurements I cut a size 40/12. The waist has a couple of inches of ease and the bust and hips are even looser, so I figured I could fit as I sewed. I found the waistline tucks a tiny bit lower than my natural waist, so took a cheeky dart out of the shoulder line to hike the whole thing up a bit. I also took two inches off the length and sewed the side seams at a slightly larger seam allowance, and the fit’s pretty perfect! Sewing it up was quick and fun, even all the tucks and darts (eight in all) which I used to avoid like the plague. If a pattern has a lot of dart/tuck markings on multiple pieces, personally I find it much more manageable to deal with preparing each piece in turn, i.e. I cut the back, marked the darts and immediately sewed those before moving on to cutting out the front. 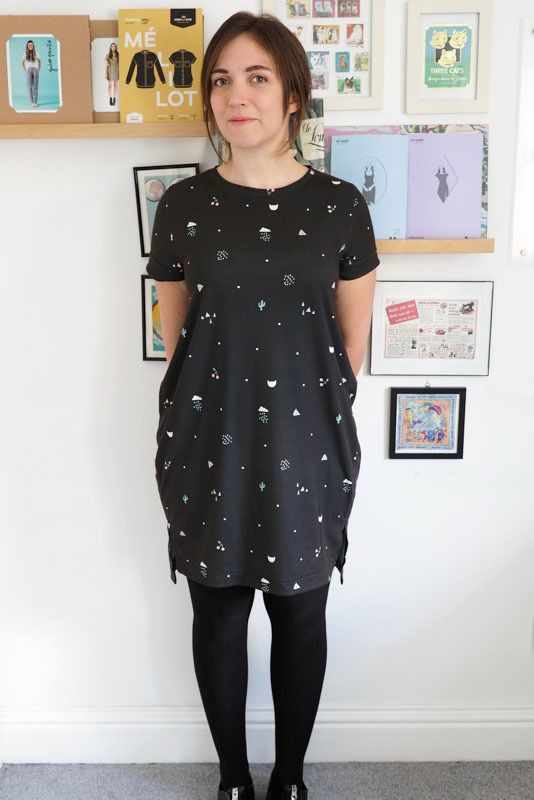 Unfortunately most of the design details get totally buried in this print, but the silhouette and the drama from the butterfly sleeves (easy-to-set raglans) make up for it. The fabric is a lovely viscose challis from Minerva. 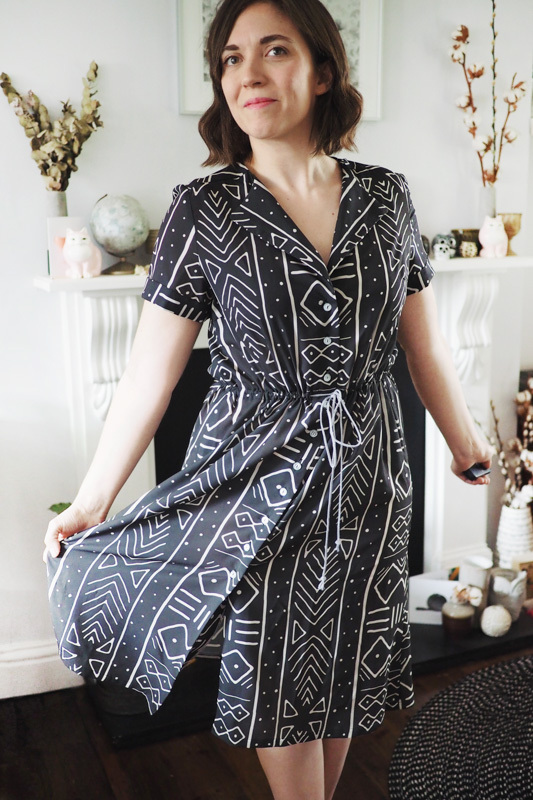 It’s now sold out; I bought the last of the reverse colourway, probably to make the top version of this pattern! 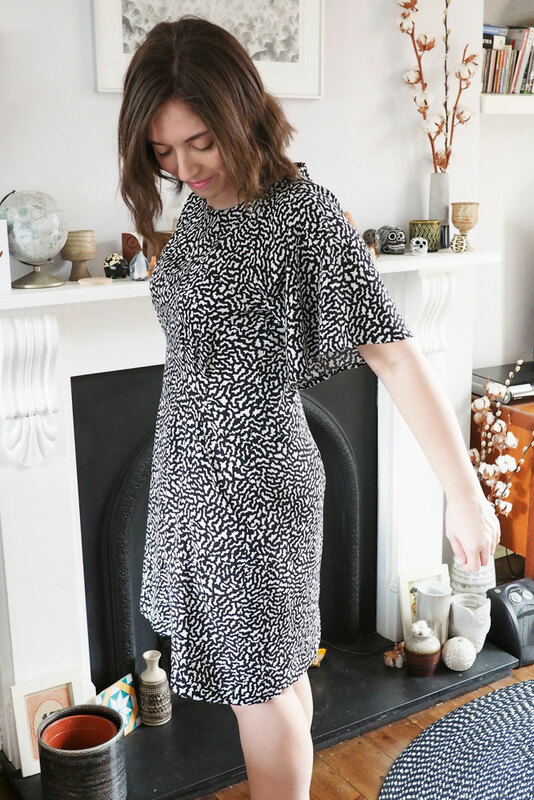 Challis has a natural springy stretch which makes it very comfy to wear, but you just have to be extra careful about not distorting it at the cutting stage. I lay the folded fabric out on my cutting mat then give it a quick press with a warm iron to get it flat and on-grain. 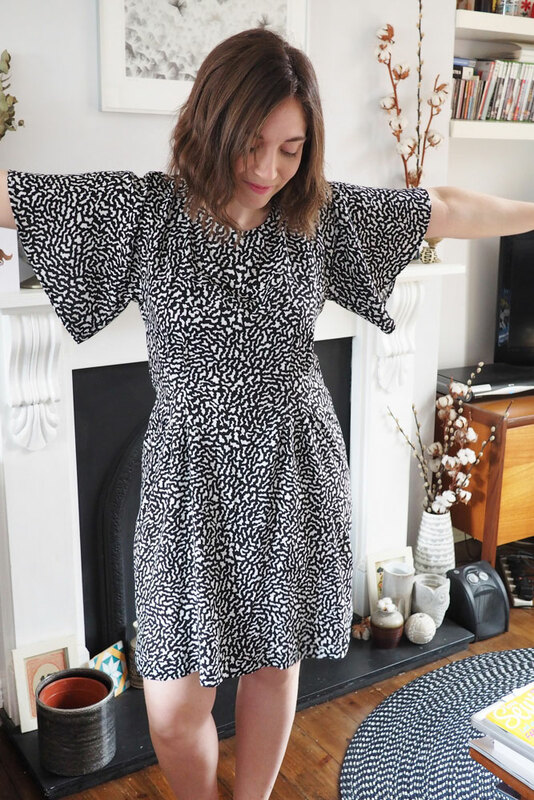 Nothing too fancy going on in the construction or finishing: I overlocked most of the seams, French seamed the side seams, and the neckline is finished with bias facing which I handstitched down. I feel like this dress is made for dancing, so hopefully she’ll get a spin soon! Allo allo! 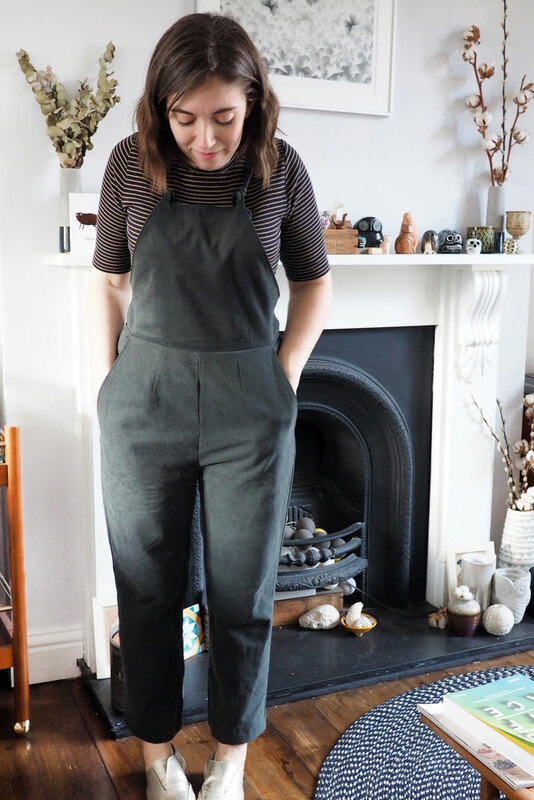 I haven’t had much time for either sewing or blogging lately, but I have been thinking about it a lot, as ever. At the weekend a bit of enforced-relaxation time meant I could get stuck into a nice project with a shiny new pattern. 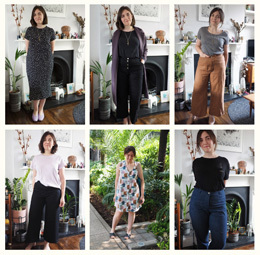 Like a lot of the sewosphere I went totally heart-eyed for Named’s new spring collection, Playground. 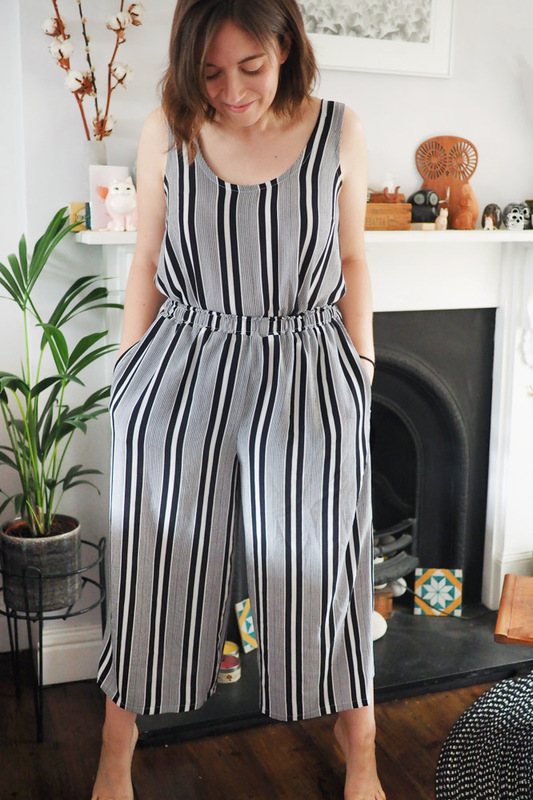 I bought two printed patterns pretty quickly: the Ansa butterfly dress/blouse and these, the Ronja dungarees. I loved the apron-style top, fitted waistline and on-trend cropped straight leg. 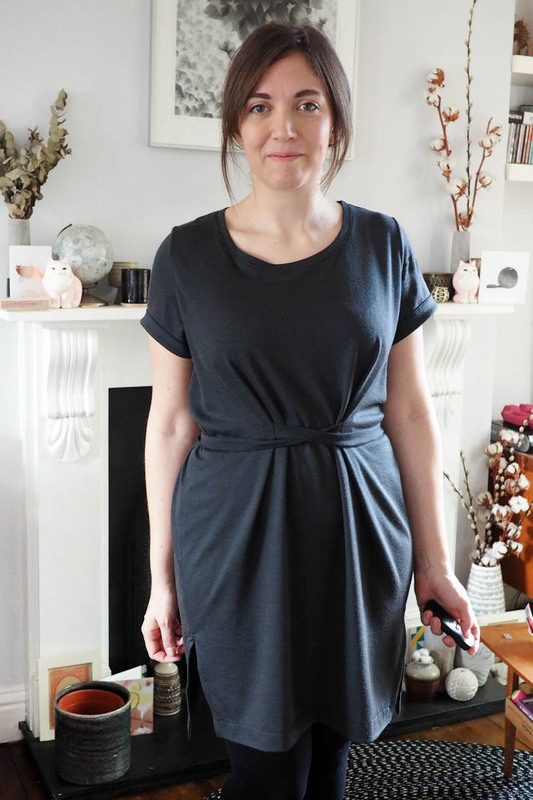 I cut a straight size 14/42 as I find Named quite narrow through the hips for my pear shape and wanted a comfortable fit through the waist. 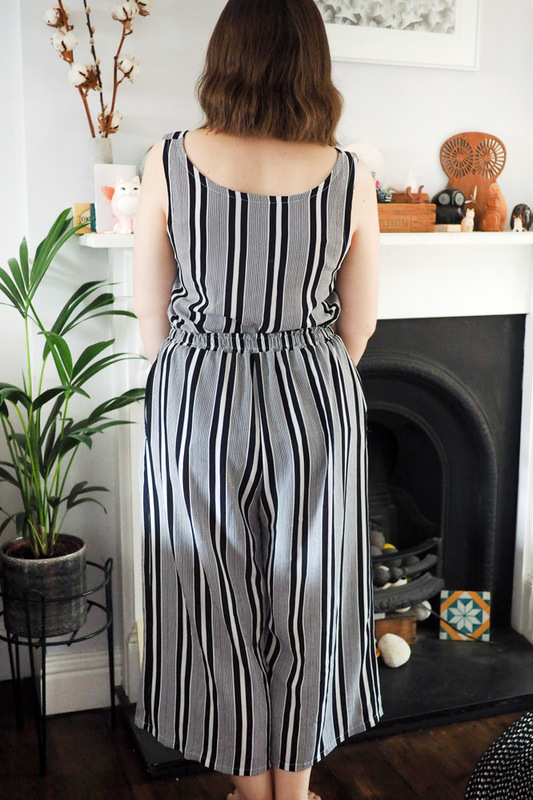 Overall this decision turned out well: there are double back and single front darts so they end up roomy through the hips and snug at the waist. I think next time I will alter the shape of the bib piece a bit though. 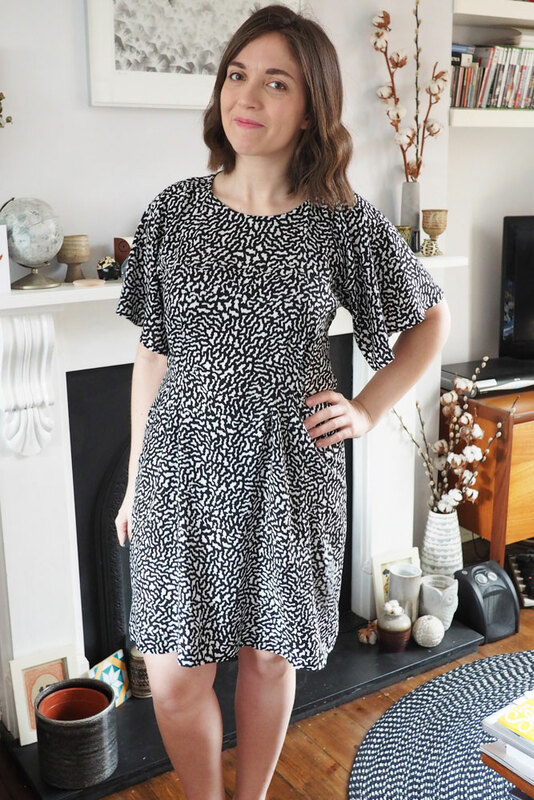 I feel like it’s quite skimpy, not wide enough across the top in particular, and almost like I need to FBA it – I’m not sure how I’d go about that! Looking at the picture below the back seems a little baggy, but a bit of ease is needed to be able to move and bend in them. 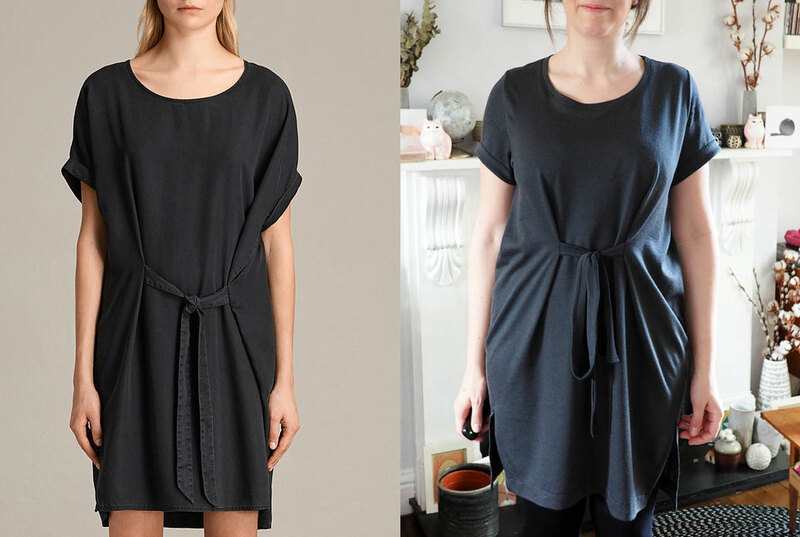 One key alteration I made was to swap the buttoned side fastenings for a simple centre-back invisible zip. I thought I’d prefer the more streamlined look and also fancied doing a technique I’ve got pretty good at than something new and potentially tricky, ha. 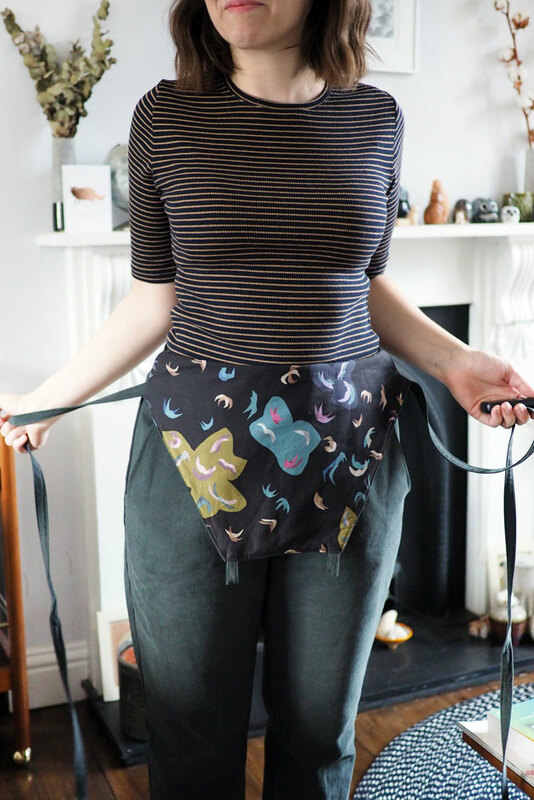 I also made self-fabric straps rather than the ribbon the pattern calls for. 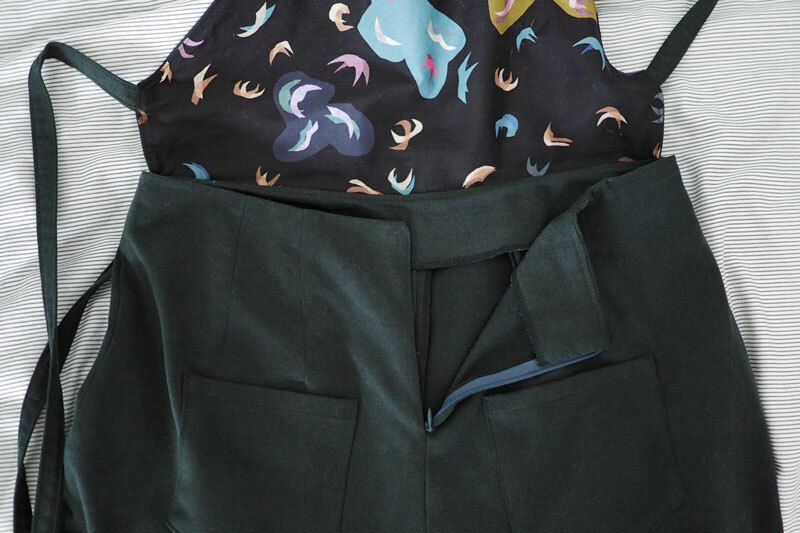 My fabric is a forest green brushed twill from Ditto that I’ve had in my stash since I went to their Brighton store for my birthday last year. Weight-wise I think it’s a good match but that peached finish does show every little dent and wrinkle. 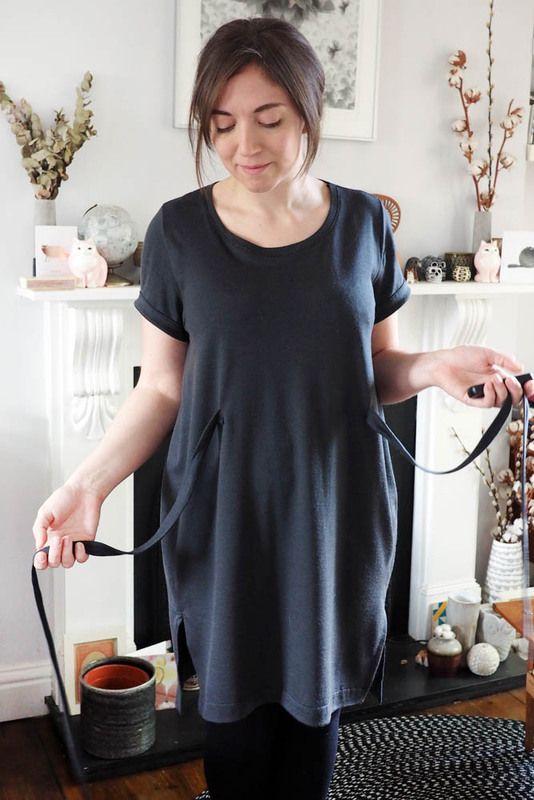 The pockets and bib are lined in lightweight cotton lawn (spot the leftover Liberty from my Sudley dress!). The instructions are very clear and you’re left with a lovely clean finish inside. The waist is finished with facings which also hide the raw bib edges, and the pockets also have a facing before the lawn lining starts. Lovely little details which I’ve come to admire from Named. 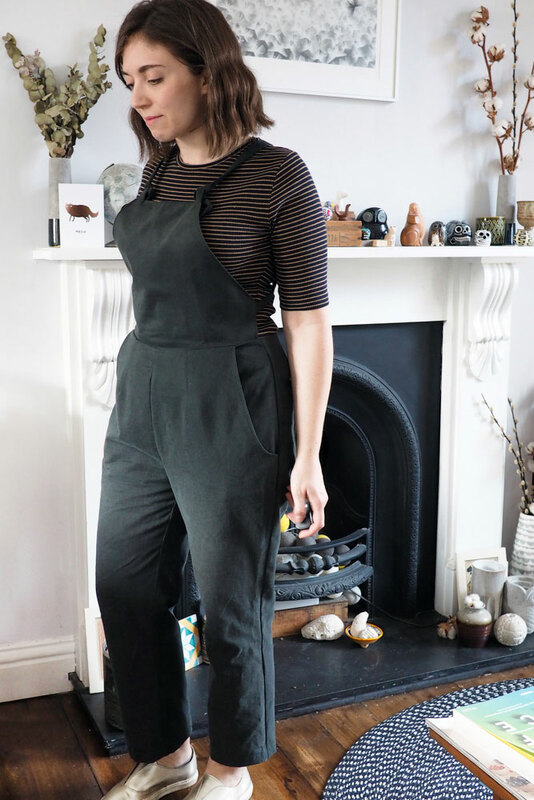 I reckon these will join my Roberts dungarees in regular rotation, and I also want to make another pair, perhaps in denim, to adjust the little fitting niggles I found. 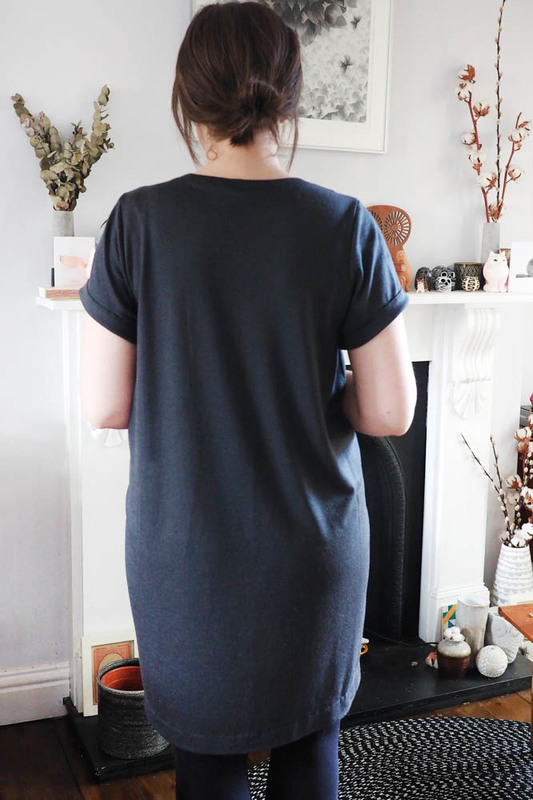 To be honest, all I want to wear at the moment is black sacks, so here’s another one to throw into the mix. 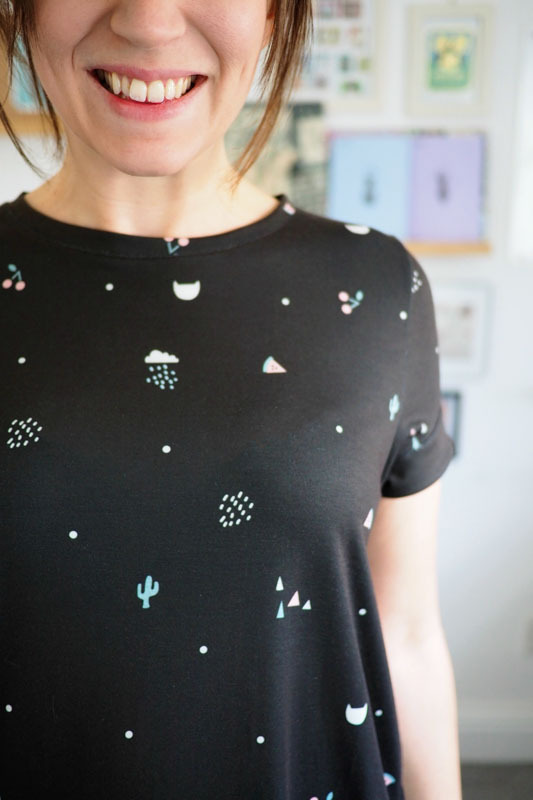 But it’s got kitties and cactuses and watermelons on it, so it ain’t all gloom. 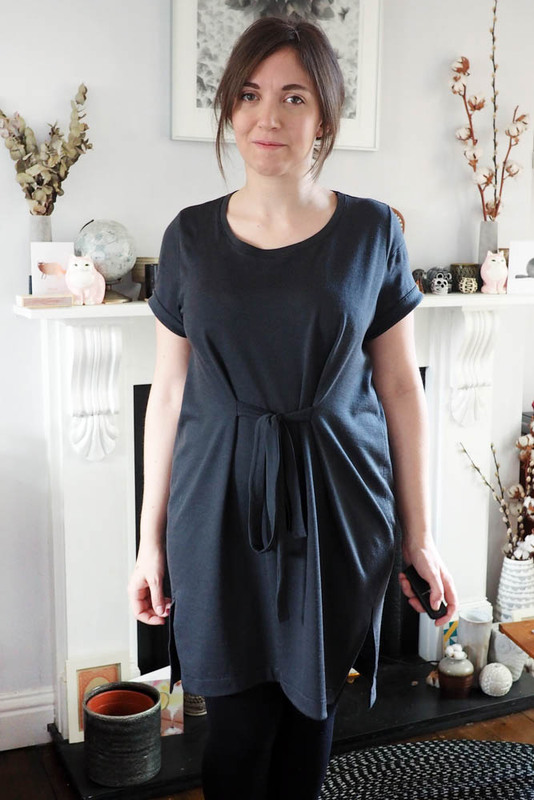 It’s my third or fourth Named Inari dress, and the first time I’ve done it in a knit rather than a woven. Naturally that makes it even more comfy! 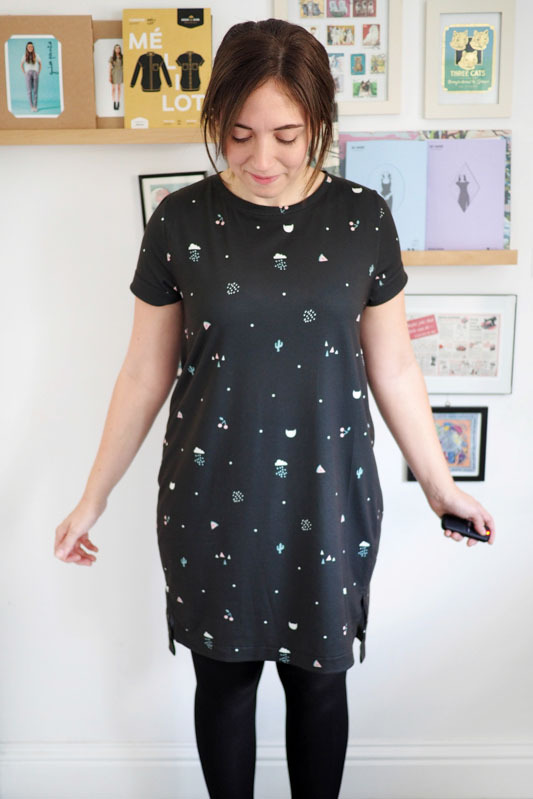 I didn’t alter anything on the sizing, and just finished the neckline with a band instead of a facing. I also topstitched the entire sleeve cuff down so it wouldn’t flip around. 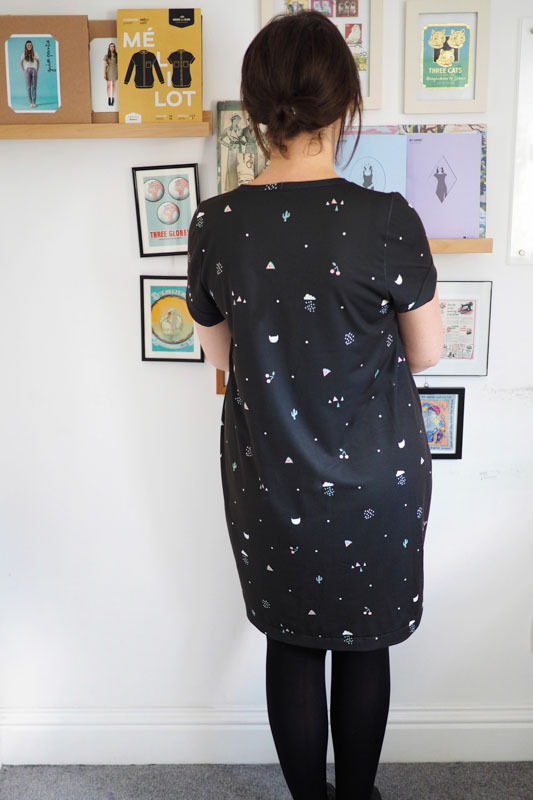 The fabric is jersey knit I had printed with my own design at the Contrado factory back in May. You can read more about it here! 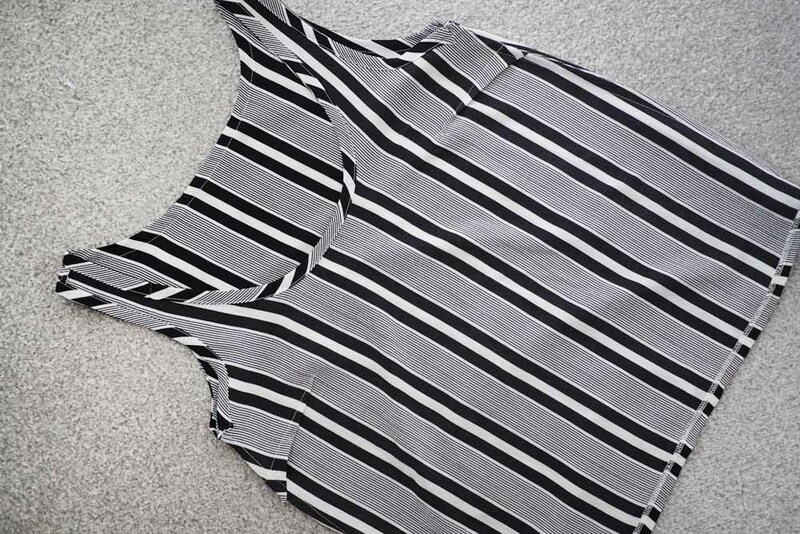 This is their 190gsm jersey substrate which is a fairly sturdy polyester-based knit with about 25% stretch, similar to a double-knit and ideal for a pattern where it’s subbing for a woven. 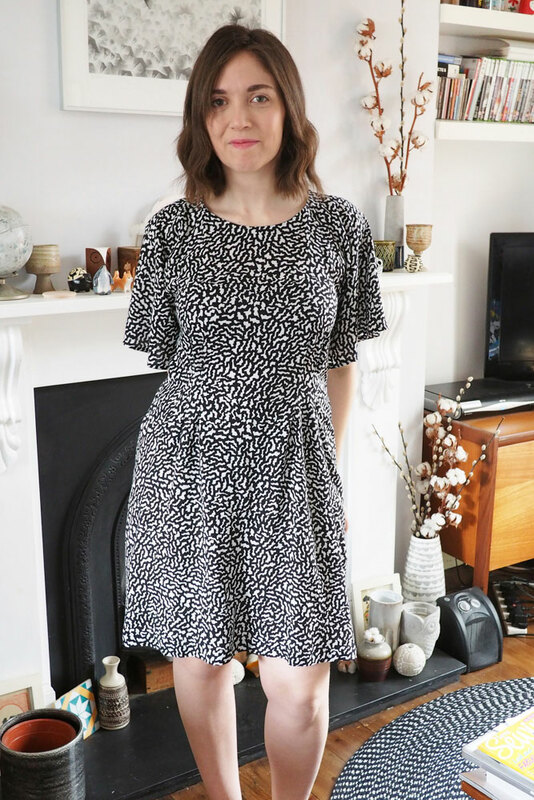 It was very easy to work with: I used the overlocker for the shoulder and armsyce seams, and lightning stitch with a walking foot on my normal machine for topstitching, hemming, and the side seams. Funny, looking at the drag lines on this one that aren’t so apparent in my woven Inaris (and not quite so apparent in real life as in these photos) it’s possible I should do an FBA to this pattern, adding a bust dart or rotating the excess down into the skirt portion. When I hike up the front under the underarms the drag lines smooth out. Perhaps it’s the heavier drape of this fabric making it more obvious here. 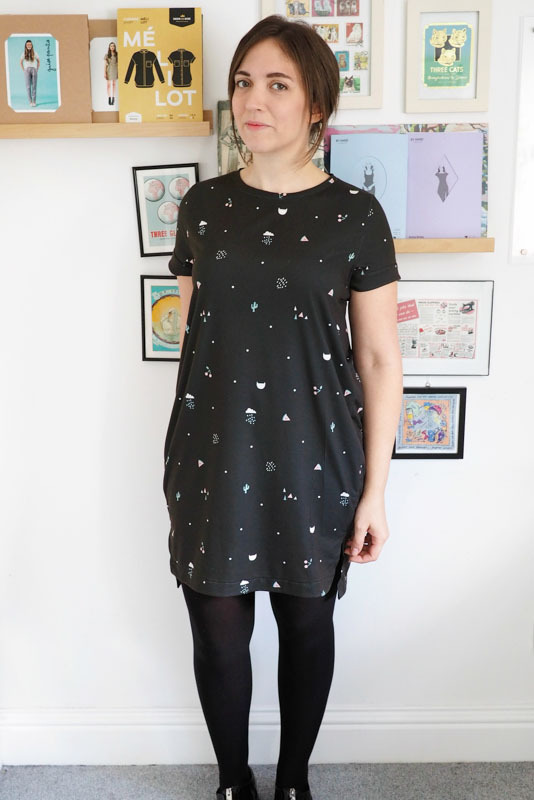 I’ve been meaning to dedicate some time to doing some new designs to get printed, as it feels extra special wearing a fabric I designed as well as sewing the garment itself and Contrado have so many interesting and apparel-appropriate substrates to print on.